Banner drop on the July 25 International Day of Solidarity with Antifascist Prisoners for ‪#‎antifa‬ prisoner Jock Palfreeman from Sydney NSW, who is currently incarcerated in ‪Bulgaria‬ for defending a young Roma from being killed by a gang of racist football hooligans. Riot police try to avoid petrol bombs during heavy clashes with anti-austerity protesters in Athens. 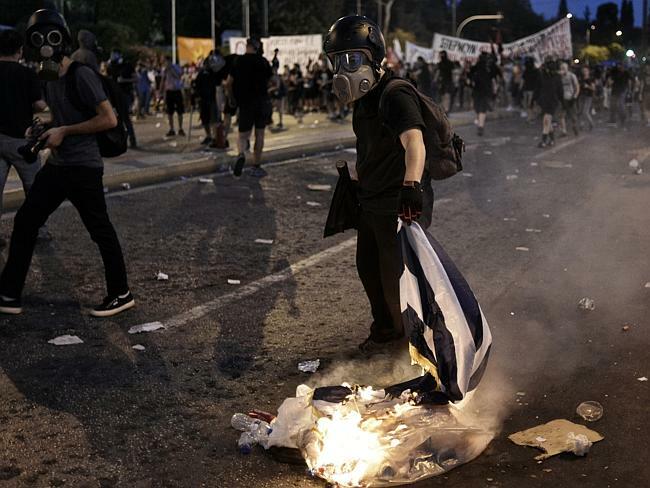 16 July – Two Melbourne police officers, honeymooning in Athens have been tear gassed during a violent protest outside the parliament where rocks and molotov cocktails were thrown at police. While inside the parliament, Greek MPs debated over the latest round of austerity reforms. Rebecca Amore and her husband, both police officers, told 3AW radio they got caught up in the violence. “It was very interesting to say the least, our hotel is literally a minute walk from Syntagma Square,” she said. “We set out for a nice romantic evening on our last night of our honeymoon. “We had a perfect spot on a balcony in a beautiful restaurant and then things started to take a turn from there. “We were on the balcony and all of a sudden we saw the police and they started to put their helmets on. Ms Amore said everyone rushed inside as the tear gas came in. “All of a sudden I got that tickle in my throat I’ve had a million times before,” she said. “I looked at my husband, I got up off the table because my eyes started to well. “Soon enough the whole restaurant ran inside, it was so potent. Meanwhile an Australian citizen was arrested during the clashes, allegedly for painting graffiti in Syntagma Metro station. They were arrested along with a number of other foreigners, including four Germans, two French citizens, one Ukrainian, one Dutch and three Poles. There were given charges relating to damage of a metro station. 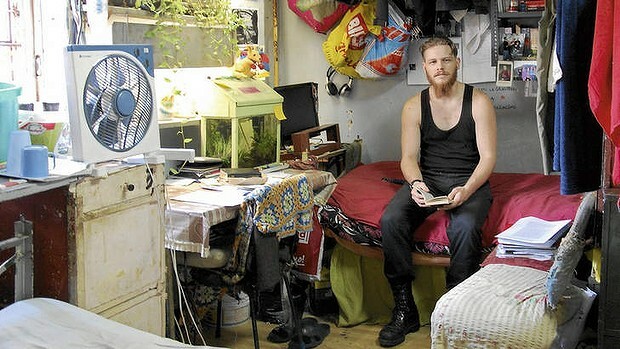 Jock Palfreeman is a young Australian currently serving a 20-year prison term in Sofia, Bulgaria. In 2009, under highly dubious circumstances, he was convicted of murder. You can read more about his case in Belinda Hawkin’s book Every Parent’s Nightmare (Allen & Unwin, 2013) and at the Free Jock website. I received the following communication from Jock Palfreeman yesterday. It contains an account of an assault upon him and a group of other prisoners on October 17. I republish it below, at his request. ContraInfo: Nearly two years ago now, we diffused a text in solidarity with antiauthoritarian comrade Diego Ríos, who has been underground since 2009 (because of the arrest warrant issued against him when his mother reported that he had stored material to manufacture explosives in a house she owned). At that time, we shared some reflections about the particularities of clandestinity for antiauthoritarian and anarchist comrades. A similar effort was made three years ago by comrades who wrote and edited the book Al Acecho (Lying in Wait); it was rooted in Diego Ríos’ case as well, and to us, it was the first text originating in Chile to address themes of clandestinity from an antiauthoritarian perspective based on a specific case. Other texts, such as the book Incógnito and the communiqués from comrade Gabriela Curilem also address anarchist/antiauthoritarian comrades’ experiences of clandestinity, a theme that seems to be infrequently discussed in these parts. Thus, we have already shared the idea of greeting our fugitive comrades and saluting their decision to struggle and evade prison, one more action against the attempts of Power to capture those who combat it. “We are urgently calling all anarchist, anti-fascist and other anti-authoritarian left wing groups to act in solidarity with Jock Palfreeman… Jock has already served several years of his 20 year sentence in Bulgaria. He actively works towards organising his fellow prisoners and highlights cases of repression by the prison authorities. He is one of the founders of the Bulgarian Prisoners Association. In the last few years, the response to his imprisonment and calls for solidarity with him from the anarchist and anti-fascist movement have been underwhelming. He needs more groups and individuals to join the campaign for his freedom. His family and some liberals have been organising support for him and trying to raise money for his fine; but Jock was always asking for a more direct kind of solidarity other than just politely asking the authorities to be nice. He needs people to not only constantly put pressure on the Bulgarian authorities in the form of letters and emails, but also organise demos and pickets outside embassies and/or any other Bulgarian institutions, generally spreading awareness about his case. 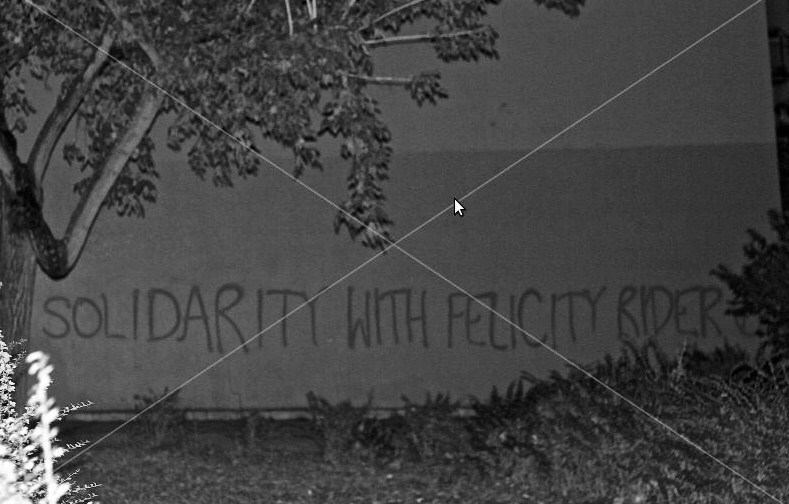 via Contrainfo: From deep within the belly of the beast we howl our solidarity with our wild sister & comrade, Felicity Ryder. Love, some comrades. On a wet and cold night we ventured out with paint cans in our pockets and the fierce desire for a free world in our hearts. On this dark winter’s night, our burning hatred for this mechanized undead system, which seeks our total exploitation from the moment we emerge from out of the womb and into the hospital (our first institution) to the moment of our last breath, lit our way through the streets.